Long before I opened my business, I knew I wanted to own a business in which I created beautiful things. I’m such a collector of skills and a lifelong learner that it was hard for me to figure out exactly what I wanted to do with my business. I enjoy making things, crafting, designing, photographing, and so much more. How on earth could I possibly narrow it down? Whenever I would talk about it with my husband, I found myself telling him that I wanted to do Pretty Much everything. 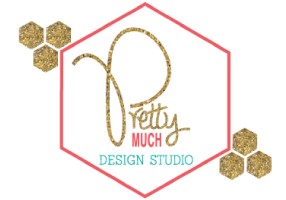 Then one day, it struck me – why not call my business Pretty Much? Then, I could do pretty much everything! So, about 3 years before I ever opened my business, I knew exactly what I wanted to call it. I liked the way I could play with the name. I could create Pretty this or Pretty that. When somebody asked me what I did, I could tell them Pretty Much everything. The more I said the name out loud, the more it felt right. Pretty Much always seems like an answer to a question, too! I find myself using the phrase all the time. Why wouldn’t I name my business Pretty Much? As time continued by, I started to wonder if it would ever be THE TIME. You know, the right time to stop everything in my life and open a business. I started to get discouraged because life just kept on happening and more times than not, I found myself carried on in other directions. I was always too busy, too tired, too involved to worry about setting up a business. but then, in September 2013 something happened. The world stopped spinning around in crazy wild busy circles. I stopped, took a few breaths, and sat down on the couch to rest. This literally happened, and in a way it also figuratively happened. In September 2013 my life changed in many ways. I got sick, went to the doctor, and got told to stop going to work. It was time to sit still, time to meditate, to think, and to dream. I couldn’t go to work, and I could barely do much of anything, but I could sit and dream. That’s exactly what I did. I dreamed about what I wanted to do. I pretty much just wanted to craft and create. I pretty much just wanted to stop working my life away at a job I hated. I pretty much just wanted to make pretty things, make people happy, and make my life more enjoyable. I decided to plan it all out. I had the time now, why not get started. On January 1st, Pretty Much was officially born and open for business. Pretty Much became real, and I was pretty much ecstatic. 9 months later, my baby is still growing. It’s still morphing into the business that I want it to be. Each day I make conscience decisions to make the business better than it was the day before. Pretty Much is a work in progress as most small businesses pretty much always are, and I wouldn’t trade that for the world. Three years before I opened my business I knew I wanted to do pretty much everything I could do. As I know that is not a very specific business identity, I narrowed that down. What makes me happy in life is celebrating. I am happiest when I am celebrating life, celebrating accomplishments, people, friendships, holidays, and most of all love. I decided that when it comes to celebrating, that’s where I wanted to focus my time and energy. So when those doors opened, Pretty Much was a business based on celebrating. I am focused on celebrating pretty much all of life’s wonderful moments and creating pretty much anything and everything to make it easier for people to celebrate those wonderful moments. Pretty Much rocks because it is a business all about celebrating, throwing confetti, happy dancing, and being lovely. It is pretty much the best business that I could possibly own!